I had the great fortune of interviewing Breeda Willis, an accomplished competitive Olympic runner and multi-faceted trainer for decades. 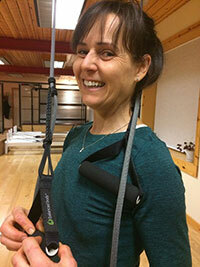 She loves suspension training and considers it a game changer with her runners, boot campers and the general population; however, when she was introduced to the Bodhi Suspension System by her friends Amy Beversdorf and Pamela Leudtke at Studio B, many "A-HA" moments surfaced. Here is her story of shifting from thinking that 2 points is the limit to 3 and 4 points becoming limitless! Tell me a bit more about your background personally and professionally? I currently train young runners from 5 years old to seniors in high school for form, strength, mobility and everything in between. This all stemmed because of my passion and success as a competitive runner. I earned a full ride track scholarship to Western Kentucky University and was a proud member of the 2000 Olympic Team in Sydney, Australia. Through many injuries, backslides in training and much more, it became my mission and passion to not only heal my own body so that I could still run competitively, but also help those interested and determined to do the same. I can now say I am still a competitive runner of over 41 years and going strong. I also teach boot camps, the general population and am a massage therapist. What was your introduction to suspension training? I found TRX years ago when it first came out through a friend. I did one workout on the suspension trainer and it was a game changer for my body. It really showed me where I was compensating and where there were "energy leaks" in my system immediately. 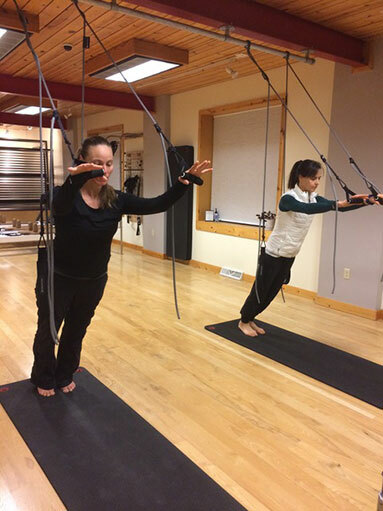 I began to pursue many certifications and education with TRX and incorporated suspension training to my personal practice as well as with my clients and classes. How did you hear about / find Bodhi? I always wanted to be able to do 4 point suspension with TRX, but couldn't get it. I train at Studio B and Amy Beversdorf brought in the Bodhi. I started taking classes on Bodhi and this is where the game changed even more with regards to suspension training. I am already Mat 1 certified through Balanced Body and I look forward to taking the 2-day training on the Bodhi next month! Talk a bit about the differences you enjoy using the Bodhi? I immediately found deeper core engagement through using the 3 and 4 point suspension opportunities with the Bodhi system. Translating this experience from me to my clients has also resonated and helped build awareness faster in their whole body integration because they don't have the opportunity to "cheat" an exercise. I also find that the Bodhi is more versatile and easier to adjust with the two sets of handles and two sets of loops. You don't have to move things around as much. 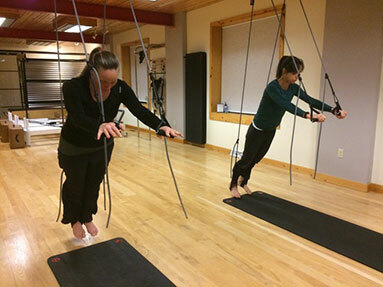 It also has a more "elastic" feel with the ropes which helps with fluidity of exercises and integrates it more into the deeper muscles of the body. Training barefoot is more comfortable and personally with my spondylolisthesis some of the Pilates mat work which is not available to me, I can simply use the loops or handles as feedback to start the initiation of the movement pattern successfully. Can you give a few sample exercises you use with clients in your practice? I love teaching side planks. Stacking the feet is easier and more comfortable. Glutes and hamstrings are a critical part of running, so I use it as a functional way to train the posterior chain before putting them into Olympic lifting scenarios with rowing and pulling movements. This is where 2, 3 and 4-point suspension all come in handy from a regressed to progressed exercise sequence. Finally, I use reverse lunges to help train gait and strength through the hips and knees with 2 and 3 points of suspension with younger runners. This is a common area of weakness and they can see and feel biomechanically where energy is leaking and how they need to figure out the fix in their physical body. In addition to injury prevention, better strength, mobility and balance, I find the Bodhi to ultimately promote joy and play with my clients, classes and running students. When they are working hard in sessions, it has been wonderful to break free and allow them to have a playground with the Bodhi Suspension System. They leave with a smile on their face, eager to return for more! Breeda hails from County Cork Ireland and began teaching at Studio B Pilates in 2016. A former Olympian, Breeda now focuses her energy helping others maintain their fitness and health from the very young to the aging adult. Breeda has life-long qualifications as a health and wellness professional, graduating with a BS and MS degrees in Health Promotion and Physical Education from Western Kentucky University. She is a IAAF World Certified Elite Running Coach, USA Weightlifting Sports Performance Coach and holds multiple certifications in functional training and sports injury therapy. Breeda compliments her fitness training as a licensed Massage Therapist and is in the process of completing the Balanced Body Pilates comprehensive training.